Sorry that you missed these ones. These guitars are no longer available, but the style and design options are still available to customize your order. Description: Modern SJ shape and bracing pattern. Premium Western Red Cedar top with silking. Highly figured Pomelle Sapele back and sides. Paua shell accented three ring rosette with radial Macassar Ebony background. Macassar Ebony binding accented by Paua Shell purfling on top. Back and side purfling lines with a boxed Macassar Ebony end wedge and Paua accents, as well as a Paua backstrip. Five piece Mahogany, Maple, Rosweood neck with hand-carved traditional pyramid style volute. Gold Gotoh 510 tuners with ebony buttons. Bound Ebony fretboard and faceplate. Hand cut "Olson" dove Paua shell fretboard inlays. Ebony heelcap. Hand cut Mother-of-pearl logo. Ebony bridge. Ebony pins with Paua dots. Unbleached bone nut and saddle. Scale length: 25.34" Nut width: 1.75" Saddle spacing: 2 5/16"
This guitar is currently available at Golden Era Guitars in Singapore. Click the link for more photos, to schedule a viewing, or to purchase. Description: Modern SJ shape and bracing pattern. Premium Western Red Cedar. Cocobolo back and sides. Paua shell accented three ring rosette with radial Cocobolo background. Peruvian Walnut binding with cross grained Cocobolo accented top purfling. Back and side purfling lines with a boxed Cocobolo end wedge with Paua accents. Five piece Mahogany, Maple, and Rosewood neck with hand-carved traditional pyramid style volute. Bound Ebony headstock faceplate. Cocobolo headstock backplate. Bound Ebony fingerboard. Black Gotoh 510 tuners with ebony buttons. Hand cut mother of pearl logo. Unbleached bone nut and saddle. Ebony bridge, Buffalo horn pins with Paua dots. Scale length: 25.34" Nut width: 1.75 Saddle spacing: 2 5/16"
Description: Traditional Dreadnaught shape and bracing pattern. Premium Adirondack Spruce top. Hondouran Mahogany back and sides. Hondouran Rosewood binding with cross grain Rosewood accented top purflings. Back and sides purfling lines. Boxed Rosewood end wedge. Cross grain Rosewood accented three ring rosette. Hondouran Mahogany neck with hand-carved traditional pyramid style volute. Bound Ebony headstock faceplate. Bound Ebony fingerboard with Mother-of-Pearl squares and diamonds fretboard inlays. Gold Gotoh 510 tuners with ebony buttons. Hand cut mother of pearl logo. Unbleached bone nut and saddle. Ebony bridge, unbleached bone pins. Scale length: 25.5" Nut width: 1.75" Saddle spacing: 2 5/16"
Description: Modern SJ shape and bracing pattern. Premium Western Red Cedar with top silking. Custom three ring rosette with Paua shell and curly Koa accents. Brazilian Rosewood back and sides.Curly Koa binding accented by Koa purfling accents on top. Back and side purfling lines with a boxed Brazilian Rosewood end wedge and curly Koa accents. Curly Koa backstrip. Five piece Mahogany, Maple, Rosweood neck with hand-carved traditional pyramid style volute. Gold Gotoh 510 tuners with ebony buttons. Larry Robinson stream inlay in an Ebony fretboard. Curly Brazilian Rosewood faceplate with curly Koa accents. Brazilian Rosewood heelcap. Hand cut Mother-of-pearl logo. Ebony bridge. Ebony pins with Parisian mother-of-pearl dots. Unbleached bone nut and saddle. Scale length: 25.34" Nut width: 1.75" Saddle spacing: 2 5/16"
Description: Modern SJ shape and bracing pattern. Premium Western Red Cedar. Three ring rosette with Paua shell accent. Brazilian Rosewood back and sides. Curly Koa binding accented by Paua Shell purfling on top. Back and side purfling lines with a boxed Brazilian RW end wedge and Paua accents. Paua shell backstrip. Five piece Mahogany, Maple, Rosewood neck with hand-carved traditional pyramid style volute. Gold Gotoh 510 tuners with ebony buttons. Bound Ebony fretboard and faceplate. Hand cut "Olson" dove Paua shell fretboard inlays. Ebony heelcap. Hand cut Mother-of-pearl logo. Ebony bridge. Bone pins with Paua Abalone dots. Unbleached bone nut and saddle. Scale length: 25.34" Nut width: 1.75" Saddle spacing: 2 5/16"
Description: Modern SJ shape and bracing pattern. Premium Sinker Redwood top. Figured Bubinga back and sides. Paua shell accented three ring rosette with radial Bubinga background. Figured Rosewood binding accented by Paua shell "Style 42" purfling on top. Back and side purfling lines with a boxed Rosewood end wedge and Paua accents, as well as a Paua backstrip. Five piece Mahogany, Maple, Rosweood neck with hand-carved traditional pyramid style volute. Gold Gotoh 510 tuners with ebony buttons. Paua shell bound Ebony fretboard and Bubinga faceplate. Bubinga headstock backplate. Hand cut "Floral" Mother-of-Pearl and Paua shell fretboard inlays. Bound Bubinga heelcap. Hand cut Mother-of-pearl logo. Ebony bridge. Bone pins with Paua dots. Unbleached bone nut and saddle. Scale length: 25.34" Nut width: 1.75" Saddle spacing: 2 5/16"
This guitar was sold through Dream Guitars in Asheville, NC. Click the link to visit their site for more photos of this guitar. Description: Modern SJ shape and bracing pattern. 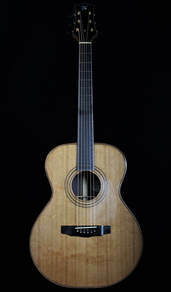 Premium Western Red Cedar top silking. Three ring rosette with Paua shell accent. East Indian Rosewood back and sides. Bubinga binding accented by Paua Shell purfling on top. Back and side purfling lines with a boxed Bubinga end wedge and Paua accents. Five piece Mahogany, Maple, Rosewood neck with hand-carved traditional pyramid style volute. Gold Gotoh 510 tuners with ebony buttons. Bound Ebony fretboard and faceplate. Ebony heelcap. Mother-of-pearl logo. Ebony bridge. Ebony pins with Parisian mother-of-pearl dots. Unbleached bone nut and saddle. Scale length: 25.34" Nut width: 1.75" Saddle spacing: 2 5/16"
Description: Traditional Dreadnaught shape and bracing pattern. Premium Adirondack Spruce top. Hondouran Rosewood back and sides. Hondouran Rosewood binding with cross grain Rosewood accented top purflings. Back and sides purfling lines. Boxed Rosewood end wedge. Cross grain Rosewood accented three ring rosette. Hondouran Mahogany neck with hand-carved traditional pyramid style volute. Bound Rosewood headstock faceplate. Bound Ebony fingerboard with Mother-of-Pearl squares and diamonds fretboard inlays. Gold Gotoh 510 tuners with ebony buttons. Hand cut mother of pearl logo. "Vintage" bone nut and saddle. Ebony bridge, unbleached bone pins. Scale length: 25.5" Nut width: 1.75" Saddle spacing: 2 5/16"
Description: Traditional OM shape and bracing pattern. Premium silky Western Red Cedar top. East Indian Rosewood back and sides. Figured Koa binding with Rosewood accented top purfling, back and sides purfling lines. Koa boxed continuous-grain Rosewood end wedge. Maple/Rosewood accented three ring rosette. Traditional chevron backstrip. Hondouran Mahogany neck with hand-carved traditional pyramid style volute. Bound Ebony headstock faceplate and fingerboard with gold Mother-of-Pearl modified fretboard inlays. Hand cut gold Mother-of-Pearl logo. Gold Gotoh 510 tuners with ebony buttons. Unbleached bone nut and saddle. Ebony bridge, Ebony bridge pins with Parisian Mother-of-Pearl dots. Scale length: 25.34" Nut width: 1.75 Saddle spacing: 2 5/16"
Description: Modern SJ shape and bracing pattern with Florentine cutaway. Premium Western Red Cedar top. Hondouran Rosewood back and sides. Flamed Koa binding with cross grain Rosewood accented top purfling. Back and sides purfling lines. Paua shell boxed Rosewood end wedge, as well as a Paua shell backstrip. Custom Paua shell accented three ring rosette with radial cut Hondouran Rosewood background, bound soundhole, and extra Rosewood accent ring. Five piece Mahogany, Maple, Rosweood neck with hand-carved traditional pyramid style volute. Bound Ebony headstock faceplate and fingerboard. Hondouran Rosewood headstock backplate. Hand cut "Olson" dove Paua shell fretboard inlays. Gold Gotoh 510 tuners with ebony buttons. Hand cut Paua logo. Unbleached bone nut and saddle. Ebony bridge. Buffalo horn bridge pins with Paua dots. Scale length: 25.34" Nut width: 1.75 Saddle spacing: 2 1/4"
Description: Modern SJ shape and bracing pattern. Premium Western Red Cedar with top silking. Three ring rosette. East Indian Rosewood back and sides. Honduran Rosewood binding accented by Rosewood purflings on top, as well as back and side purfling lines with a boxed Rosewood end wedge. Gold Gotoh 510 tuners with ebony buttons. Bound Ebony fretboard and faceplate. Ebony heelcap. Mother-of-pearl logo. Ebony bridge. Ebony pins with Parisian mother-of-pearl dots. Unbleached bone nut and saddle. Scale length: 25.34" Nut width: 1.75" Saddle spacing: 2 5/16"
Description: Modern SJ shape and bracing pattern. Silky Western Red Cedar top. Gorgeous waterfall Cocobolo back and sides. Peruvian Walnut binding with Paua Abalone accented top purfling, back strip, and boxed continuous-grain Cocobolo end wedge. Paua shell accented three ring rosette with radial Cocobolo background. Five piece Mahogany, Maple, and Rosewood neck with hand-carved traditional pyramid style volute. Bound Ebony headstock faceplate. Cocobolo headstock backplate. Bound Ebony fingerboard with Paua fretboard markers. Gold Gotoh 510 tuners with ebony buttons. Hand cut mother of pearl logo. Unbleached bone nut and saddle. Ebony bridge, unbleached bone pins with Paua dots. 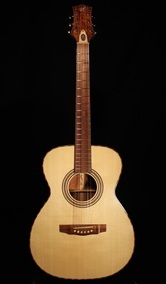 Scale length: 25.34" Nut width: 1.75 Saddle spacing: 2 5/16"
This guitar was sold by Fine Luthiers in South Korea. Click the link for photos, sound and visual clips, or to purchase. Description: Traditional OM shape and bracing pattern. Lutz Spruce top. Koa back and sides. Walnut binding with Maple/Walnut traditional style accented top purfling, back and sides purfling lines. Walnut boxed Koa end wedge. Maple/Walnut accented three ring rosette. Figured flamed Maple neck with Walnut laminate strips, hand-carved traditional pyramid style volute. Bound figured Koa headstock faceplate, custom "FJ" mother of pearl logo inlayed in Walnut medallion inlayed in flamed Maple truss rod cover. Desert Ironwood fingerboard with gold ring inlays. Silver Waverly tuners with polished silver buttons. Hand cut mother of pearl logo. Unbleached bone nut and saddle. Desert Ironwood bridge, unbleached bone pins. Scale length: 25.5" Nut width: 1.75 Saddle spacing: 2 5/16"
Description: A modern SJ shape and bracing pattern. 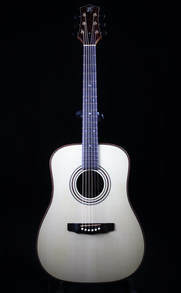 Premium Adirondack Red Spruce top with three ring rosette. Back and sides are highly figured fiddleback Honduran Mahogany. Honduran Rosewood binding accented by Rosewood purflings on top, as well as back and side purfling lines with a boxed figured Mahogany end wedge. Gold Gotoh 510 tuners with Ebony buttons. Bound figured Ebony fretboard and faceplate. Matching abalone dot inlays on fretboard face and side markers. Ebony heelcap. Mother-of-pearl logo. Ebony bridge. Bone pins with abalone dots. Unbleached bone nut and saddle. Scale length: 25.34" Nut width: 1.75" Saddle spacing: 2 5/16"
Description: A small bodied Parlor shape and bracing pattern. 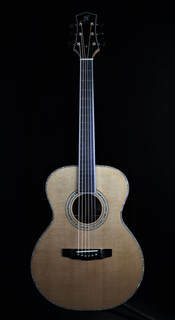 Premium Sitka Spruce top with three ring rosette. Back and sides are highly figured fiddleback Honduran Mahogany. Honduran Rosewood binding accented by vintage purflings on top, as well as back and side purfling lines with a boxed Honduran Rosewood end wedge. Gold Waverly tuners with Ebony buttons. Bound figured Ebony fretboard and faceplate. Pearl shell handlebar inlay pattern on fretboard. Ebony heelcap. Mother-of-pearl logo. Ebony bridge and pins with Parisian mother-of-pearl dots. Unbleached bone nut and saddle. Scale length: 25" Nut width: 1.75" Saddle spacing: 2 5/16"
Description: Traditional OM shape and bracing pattern. Adirondack Red Spruce top. Brazilian Rosewood back and sides. Ziricote binding with Paua shell style-42 top purfling, Paua shell back and sides purflings. Paua shell boxed Brazilian Rosewood end wedge. Paua shell three ring rosette. Figured Honduran Mahogany neck with hand-carved traditional pyramid style volute. Triple-bound Brazilian Rosewood headstock faceplate and fingerboard with traditional style-42 fingerboard inlays. Gold Waverly tuners with Ivoroid buttons. Custom Paua shell logo. Unbleached bone nut and saddle. Brazilian Rosewood bridge, unbleached bone pins with Paua dots. Scale length: 25.5" Nut width: 1.75 Saddle spacing: 2 5/16"
Description: A modified OM body shape and with traditional bracing pattern. Incredible high-grade Sitka Spruce top with three ring rosette backed by radial cut Honduran Rosewood. Back and sides are a beautiful ribbony W. African Mahogany. Honduran Rosewood binding accented by purflings on top, back, and sides, with a boxed Honduran Rosewood end wedge. Gold Waverly tuners with Ebony buttons. Bound Ebony fretboard and faceplate. Gold circle side marker dots. Ebony heelcap. Mother-of-pearl logo. Ebony bridge and pins with Parisian mother-of-pearl dots. Unbleached bone nut and saddle. Scale length: 25.5" Nut width: 1.75" Saddle spacing: 2 5/16"
This guitar was available at The Guitar Gallery in Nashville, TN. Click on link to be redirected to their site for more photos and sound clips for a limited time. 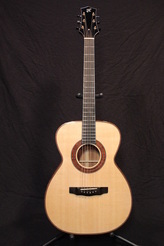 Description: This OM-H offers a true flattop Western Red Cedar top braced in an Olson style. Back and sides are straight-grain, quartsawn Padauk. Three ring rosette with radial cut Padauk background. Peruvian Walnut binding accented by purflings on top, back, and sides, with a boxed Peruvian Walnut end wedge. Honduran Mahogany neck featuring a hand-carved traditional pyramid volute and a two way adjustable truss rod. Gold Waverly tuners with Ebony buttons. Bound Ebony fretboard and faceplate. Ebony heelcap. Mother-of-pearl logo. Ebony bridge and pins with Parisian mother-of-pearl dots. Unbleached bone nut and saddle. Scale length: 25.34" Nut width: 1.75" Saddle spacing: 2 5/16"
Description: This OM-H offers a true flattop Western Red Cedar top braced in an Olson style. Back and sides are Indian Rosewood. Three ring rosette with radial cut Rosewood background. Curly Maple binding accented by purflings on top, back, and sides, with a boxed Curly Maple end wedge. Honduran Mahogany neck featuring a hand-carved traditional pyramid volute and a two way adjustable truss rod. Gold Waverly tuners with Ebony buttons. Bound Ebony fretboard and faceplate. Ebony heelcap. Mother-of-pearl logo. Ebony bridge and pins with Parisian mother-of-pearl dots. Unbleached bone nut and saddle. Scale length: 25.34" Nut width: 1.75" Saddle spacing: 2 1/4"
Description: A modified OM body shape with traditional bracing pattern. Adirondack Red Spruce top with segmented Cocobolo rosette. Cocobolo back and sides. Curly Maple binding and end wedge with purflings accenting top, back, and sides. Honduran Mahogany neck with hand-carved traditional pyramid style volute. Bound Cocobolo headstock faceplate. Gold Waverly tuners with Ebony buttons. Mother-of-Pearl logo. Ebony fingerboard with Mother-of-Pearl tiny dot fretboard inlays. Unbleached bone nut and saddle. Ebony bridge and pins with Parisian Mother-of-Pearl dots. Scale length: 25.5" Nut width: 1.75" Saddle spacing: 2 5/16"
Description: Traditional OM shape and bracing pattern. Adirondack Red Spruce top. Three ring Paua shell rosette with radially cut Panama Rosewood background. Panama Rosewood back and sides. Bolivian Rosewood binding with Paua shell top purfling, back and sides accented with purfling. Boxed Bolivian Rosewood end wedge. Darkened Honduran Mahogany neck with hand-carved traditional pyramid style volute. Bound Ebony headstock faceplate and fingerboard. Gold Waverly tuners with Ebony buttons. Mother-of-pearl logo. Unbleached bone nut and saddle. Ebony bridge and pins with Parisian Mother-of-Pearl dots. Scale length: 25.5" Nut width: 1.75 Saddle spacing: 2 5/16"
Description: A traditional OM body shape and bracing pattern. Bearclaw Sitka Spruce top with three ring rosette backed by radial cut Panama Rosewood. Back and sides are quartersawn Panama Rosewood. Bolivian Rosewood binding accented by purflings on top, back, and sides, with a boxed Bolivian Rosewood end wedge. Honduran Mahogany neck with hand-carved traditional style pyramid volute. Gold Waverly tuners with Ebony buttons. Bound Ebony fretboard and faceplate. Ebony headplate back veneer and heelcap. Mother-of-pearl logo. Ebony bridge and pins with Parisian mother-of-pearl dots. Unbleached bone nut and saddle. Scale length: 25.5" Nut width: 1.75" Saddle spacing: 2 5/16"
Description: This guitar was built in the shop of Jim Olson. A mighty thanks goes to Jim for his generosity of materials, tools, shop space, and time in the construction of this instrument. It is based directly on the Olson SJ body style and bracing pattern. You can even see the "O" engraved tuners supplied by Jim in the photo gallery. This guitar was build pre-"H" headstock logo design, and so it carries a triad inlay in its place. A Western Red Cedar top with a three-ring Paua shell rosette. Brazilian Rosewood back and sides. Rosewood binding and end wedge with purflings accenting top, back, and sides. Signature Olson 5 piece Rosewood, Maple, and Mahogany laminate neck with traditional pyramid style volute. Bound Ebony headstock faceplate. Gold Gotoh 510 tuners with Ebony buttons. Bound Ebony fingerboard. Unbleached bone nut and saddle. Ebony bridge and pins with Mother-of-Pearl dots. Scale length: 25.34" Nut width: 1.75" Saddle spacing: 2 1/4"